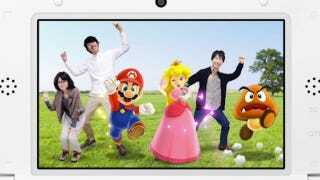 Later this month, Nintendo will start selling pre-paid cards for downloadable 3DS games that come with AR cards for Issho ni Photo: Super Mario ("Photos Together with Super Mario"). It's a new 3DS app that uses the AR cards to allow you to take snaps of and with the Mario characters. The first set, on sale April 23 in Japan, features Goomba, Mario, and Peach. The release date for the second set will come at a later time.